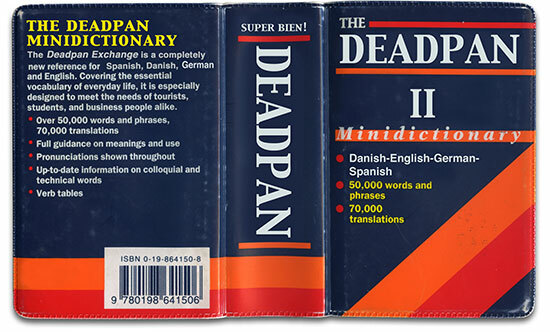 Deadpan Exchange II will take place over the course of the evening of June 13 at super bien! in Berlin. The one night festival will be an exploration of the deadpan aesthetic. It will consist of performances, artwork, and video screenings from Denmark, Spain, Germany and the United States. The organizers of this exhibition and screening feel that we are at a black and white point in history, a place where individuals are no longer asked to process the world around them. Instead they can simply download an opinion or a point of view. The reality of the situation is that life is a messy endeavor that requires a constant need for interpretation and examination. The deadpan aesthetic takes the viewer to the grey area between the black and white facts and directly into the messiness of interpretation. Through humor, absurdity and tragedy, this aesthetic asks the viewer to interpret and thereby acknowledge the existence of the work they are viewing as well as their own existence.